Rosh Hashanah, the Jewish New Year, begins Wednesday evening at sunset. I’m going to salute our Jewish brothers and sisters by lifting a glass of Israeli wine! The Winemakers Guild takes you on a journey of discovery each month. Our primary focus is Women Winemakers and the artisan wineries that they own, manage, where they make wine. Israel may appear to be a tiny nation on the map, but it has room for 13,585 acres of vineyards that grow about 66,000 tons of grapes for about 60 major wineries and more than 300 “boutique wineries and garagistes,” according to the Wines-Israel website. Israel’s relatively arid but temperate Mediterranean climate fosters a European-style wine industry based largely on a roster of wine grapes that look a lot like Southern France, predominantly Cabernet Sauvignon (18%), Carignan (17%), Merlot (13%), and Shiraz (7%). Vineyards sprout all over the country, from Golan Heights and Galilee in the North to the Negev desert in the South. Israel’s wine exports have risen sharply this century, from $8 million in 2002 to $40 million in 2014, and the lion’s share of those wines – over 55 percent in 2014 – come to North America, mostly to the U.S.; another 35 percent went to Western Europe. 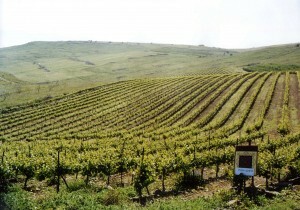 A scenic view of a Recanati vineyard in Israel. Much of this import flood comes from the five largest wineries, which each produce more than 2 million bottles annually: Carmel, Barkan, Golan Heights, Teperberg 1870, and Arza. They are followed by medium-size wineries making over 850,000 bottles per year: Zion, Jerusalem, Tabor, Binyamina, Recanati (the producer of today’s featured wine), Tishbi, Dalton, and Galil Mountain. These are the labels we’re most likely to find on U.S. retail shelves, although in my experience, retailers outside the major metropolises will have only a handful. It goes without saying that most of Israel’s wine – although not every drop of it – is kosher. Let’s talk about that, and try to banish a few myths, starting with the notion that all kosher wine is thick, sweet and grapey. 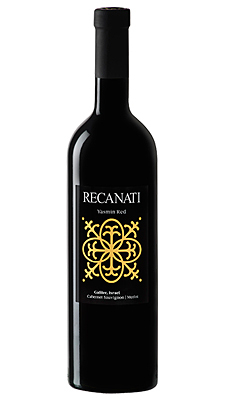 This is not a religious requirement, and this style is not the custom among Israeli wines. Artisan women winemakers produce some of the world’s most amazing wines. 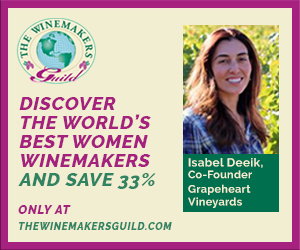 This underappreciated segment of the wine industry deserves to be highlighted, and The Winemakers Guild delivers wines of these artisan winemakers to your table every month: Handcrafted limited production wines that are produced with heart and soul. Our shipments feature artisan winemakers of all genders, but our focus is to discover and offer wines by superior women winemakers. The Winemakers Guild has over 40 years of experience in the wine industry. We’ve developed relationships across the globe that allow us to connect with some of the most dedicated winemakers in small family run wineries. You can taste this dedication to quality in every single bottle. Every wine we sell carries a complete guarantee. Not ready to commit yet? Check out our Sale Wines for WineLoversPage.com readers. Click to Sign Up! you’ll save 30 to 60%. The familiar Mogen David and Manischewitz simply represent a style of kosher wine that became popular in the United States more than a century ago, when many Jewish immigrants lived in the Northeast and had easy access to Concord and other native American grapes with a distinct “grape-jelly” flavor that needs sweetening to make it palatable. Necessity became the mother of tradition, and for many years “kosher” in wine almost always meant heavy and sweet. In fact, “Kosher” simply means “fit and proper” in Hebrew. Any food or drink that conforms to Jewish dietary laws and is made under the supervision of a rabbi may be certified and labeled as kosher. No non-kosher product may be used to make kosher wine. This provision, by the way, makes kosher wine of interest to vegans, who can be confident that kosher wines have not used animal products for clarification. Some kosher wines will also be labeled “made from grapes that are not ‘orla,'” meaning that the vineyard followed the Talmudic requirement of not using grapes from vines less than four years old … a practice that is also followed for non-ritual reasons by many quality vineyards whose producers simply understand that immature grapevines don’t make the best wine. Wrapping it up, there is nothing about kosher requirements that prevents making wines in an international, modern style. Many modern kosher wines have won awards in major competitions. And you don’t have to be Jewish to enjoy them. L’shanah Tovah! L’Chaim! My local price is well above Wine-Searcher.com’s $12 average retail, particularly since many vendors in New York and Los Angeles offer it under $10. It’s not unfair at the higher price, though, and if I had to have a kosher and mevushal wine for religious reasons for the high holidays, I wouldn’t object.